The Hewlett suspension disks were widely used across the country for several decades and a few can still be found in service in remote areas. The greatest advantage of this first practical suspension insulator was the absence of any form of cement. In contrast, the cap and pin suspension insulator required the use of Portland cement to secure the metal cap on the top and the metal pin in the hole formed on the underside. Early attempts at making cap and pin suspension insulators met with limited success because the weight and strain of the power line often pulled the metal parts off the insulator and thermal expansion of the cement frequently caused the porcelain body to crack and fail. Such problems began to occur just a few years after installation. The Hewlett insulator had none of these problems. The major disadvantages of the Hewlett disk were complicated assembly, gross weight of a completed string, and poor electrical properties which resulted in radio interference. Later improvements in the interconnecting hardware did make assembly easier. The major advantage of the Hewlett insulator and its use as a suspension system was allowing the power industry to break the 60,000 volt barrier imposed by the use of multipart pin-type porcelain insulators. The Hewlett suspension disk allowed construction of more efficient power lines with voltages of 100,000 volts and higher. In the late 1910’s, the Hewlett was in such great demand that two companies were granted licenses to produce insulators based on the original General Electric patent. In July 1988, I took several photographs of an early installation of Hewletts at Coal Bank Pass between Durango and Silverton, CO. The photographs were on slides and I just recently had them converted into prints. Two of the photographs are shown in this column. Note the very old wooden pole and the three strings of Hewletts with four insulators in each string. The pole was used as a corner support for a sharp turn in the 3-phase power line. Note, too, the metal arcing rings which helped prevent damaging flashovers caused by wet weather or nearby lightning strikes. A line crew would find access to these poles difficult because a bucket truck would be out of the question in this very mountainous region. That probably explains why these Hewlett strings have survived so long. I would bet that the line has now been upgraded. Three strings of four 10” Hewlett suspension insulators with arcing rings used to support the strain of the power line turning a sharp angle. Location is Coal Bank Pass, CO in 1988. 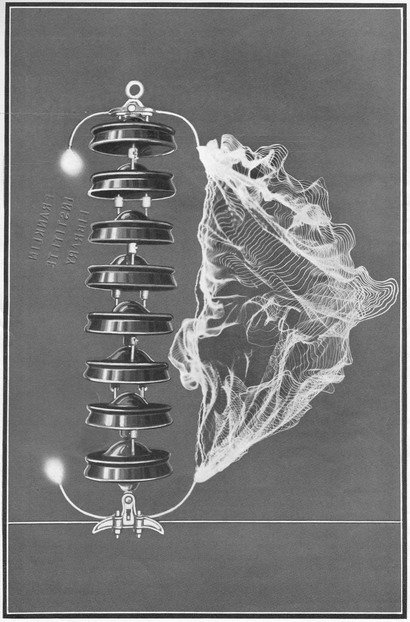 The first suspension insulator was patented by Fred Locke on January 10, 1905 (No. 779,659; see my book, Fred M. Locke: A Biography). This design was rigid with the metal cap and pin either cemented or screwed on the porcelain disk. Fred Locke did develop other suspension insulator designs which were mostly impractical because they were either too heavy, difficult to make, or complicated to assemble. On October 18, 1910, Fred Locke was granted a patent for a suspension insulator similar to the cap and pin disk which used eye hooks as connectors. The string of insulators was mounted between two crossarms and the conductor was attached in the middle of the string. This was not quite the suspension system that industry later accepted. On February 25, 1908, John Duncan was granted a patent for a cap and pin suspension insulator that was composed of two porcelain shells cemented together. See the catalog page below from the 1910 Locke catalog. The three styles of Duncan's 2-part multipart suspension insulator had a high failure rate because of cement expansion and specimens today are considered very rare. On January 25, 1910, A. O. Austin was granted a patent for the first cap and pin suspension insulator that used a ball and socket coupling. The patent was assigned to Austin’s employer, Akron Hi-Potential Porcelain Co., which was later purchased by the Ohio Brass Co. in August 1910. The suspension disk with ball and socket coupling was shown in the July 1910 Ohio Brass catalog and this basic feature was part of nearly every suspension insulator offered by O-B for many years. A French citizen named Charles Priestley took a different approach and obtained a patent on October 1, 1912, for what we now call the “hog’s liver” or “pork liver” insulator. The insulator was composed of a pair of saddles disposed of each other with interlocking grooves formed in the porcelain body to receive metal cables or links (similar to the Hewlett). The interlocking feature prevented the conductor from dropping to the ground if the porcelain body was broken. The Priestley patent application was filed on Dec. 20, 1910. O-B licensed the Priestley patent and cataloged the insulator for many years. It was not advertised as a suspension insulator but rather as a Link Strain Insulator. O-B probably considered the link strain inferior to their cap and pin insulators for suspension service and the interlocking configuration proved important in strain services. Ohio Brass acquired the rights to the Priestley patent before the patent was granted in 1912. The July 1910 and July 1911 O-B catalogs did not show the Priestley link strain insulator, but the 1912 O-B catalog did show it with the note “Patent Applied For”. It offered the following description: “This insulator is used for horizontal spans or dead-ending feeder wires. The wire can be easily threaded as the holes are practically straight. The flanges not only increase the arcing distance, but also provide additional protection in case of storms. In case the insulator should be broken, the wire cannot fall as the loop of one piece passes through the other.” The working voltage of the link strain was listed as 11,000 volts. Link Strain insulator shown in Ohio Brass catalogs from 1912 (left) and 1919 (right). Note the sharp flange edges on the earlier version and the more rounded edges on the later version. You can see the embossed O-B logo marking on each insulator. Very rare pumpkin colored O-B link strain found by Robin Harrison and Ed Sewall in the northwest. O-B continued to catalog the link strain insulator as late as 1940 (apparently discontinued in 1947 catalog). 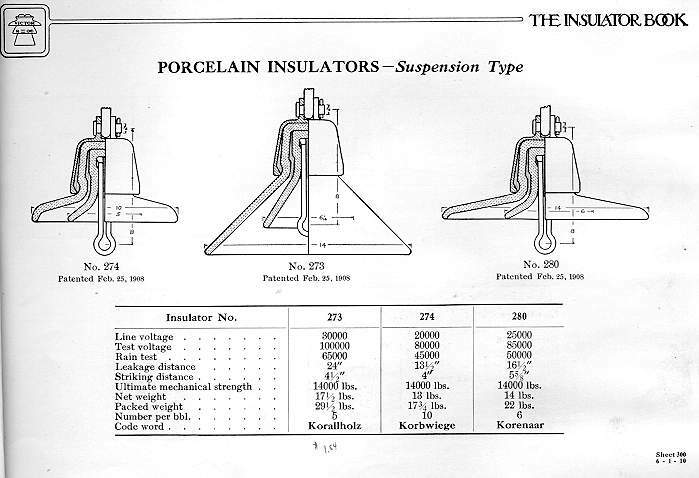 Note that the illustration of the link insulator in the 1912 catalog has sharp flange edges and the one in the 1919 catalog shows rounded edges. The change to the rounded edge design occurred quickly as it was first shown in the 1914 O-B catalog (I don’t have a copy of the 1913 catalog) and continued without change until the link strain was discontinued. Edward Hewlett developed an insulator that utilized the same interlocking principle embodied in the Priestley patent. Hewlett was granted patent No. 1,110,934 on September 15, 1914. The patent application was filed three years earlier than the Priestley patent on April 30, 1907. The patent was assigned to the General Electric Co. in Schenectady, NY. The Hewlett was designed to be washed by rain to reduce contamination effects, maintain a dry surface area to reduce electrical leakage, and be strong enough to withstand great strains from the conductor. The new insulator was announced by Hewlett in a paper he presented at the AIEE annual conference in Niagara Falls on June 26, 1907, and the paper was later reprinted in the July 20, 1907 issue of Electrical Review. 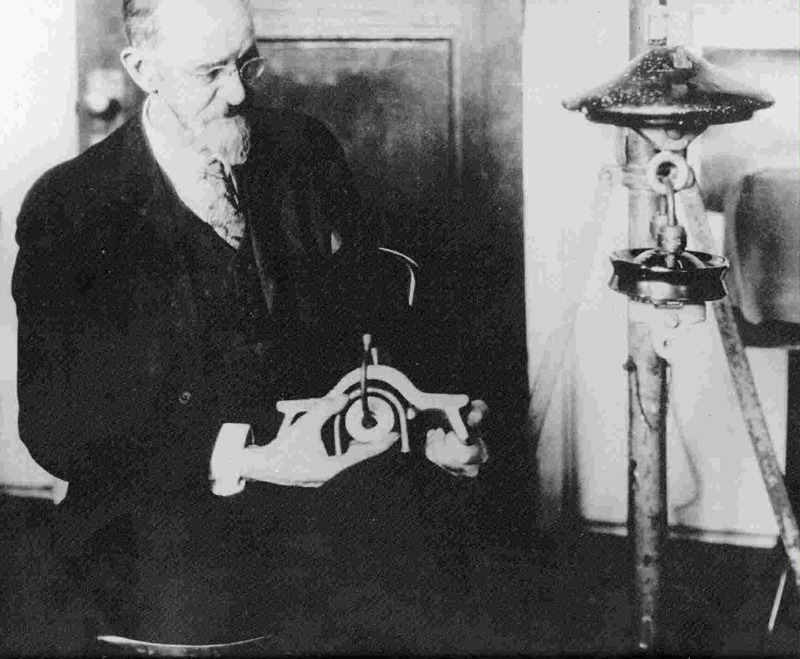 Mr. Hewlett demonstrating interlocking link in a Hewlett suspension disk cut in half to show the detail. Note the small Hewlett disk to the right under the Hewlett shaped like a flying saucer.